This exquisite couple gave us the honour of having their indian wedding photography, on one of the Cape’s luxurious wine farms. 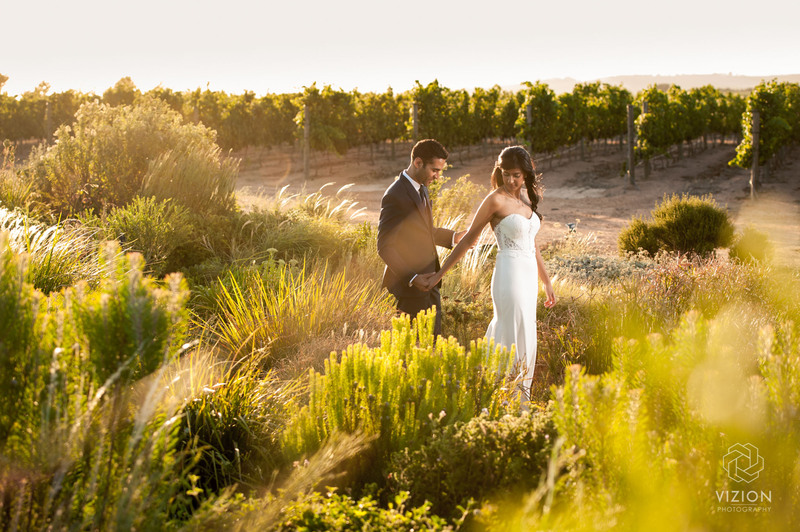 Situated with the perfect setting, a landscape of humble mountains and lavish wine farms, Cavalli Wine Estate made for a picture-perfect venue for Aalia and Vimal’s wedding. The wedding was overflowing with bright and bold colours creating a joyful vibrancy throughout the whole day. The couple enriched the wedding with their culture and traditions making it an absolute privilege to capture this Indian wedding photography. Aalia got ready in one of the suites at Lord Charles, the guests slowly starting to arrive at Cavalli full of excitement and anticipation for the day ahead . The ceremony took place in Cavalli’s beautiful sunken garden with gorgeous scenery all around. The guests were all seated, with their uniquely exquisite programmes on a wooden stick, fanning away the friendly warmth as they waited patiently. Vimal was the first to arrive, dressed all in white looking very dashing and with both mother and farther on either-side; creating a memorable moment between parents and son. So special! Soon after was the gorgeous Bride, radiating with elegance and natural beauty, accompanied with both her mother and farther too, glided down the aisle to her soulmate. The ceremony was beautiful and complete with raw emotions and genuine love and adoration. Such a perfect picture opportunity for our Indian wedding photography! Once they were pronounced husband and wife and sealed it with an adoring kiss, the guests celebrated in the moment and the family threw petals on the newlyweds. Such a happy moment! The reception hall had been transformed into a place of simplistic wonder. From the soft pastel colours from the opulent flowers to the personalised menus and custom folded napkins, the hall was plush and charming. We loved using the aesthetic monogram that they had created, with the glamorous gold writing of the guests names in our Indian wedding photography. Our eyes were drawn instantly to the breathtaking cakes that were on display and couldn’t resist sneaking a few salivating shots. So scrumptious! The guests entered with a happy murmur about them as they slowly made their way to their seats. The blissful couple entered the venue once the noise had dimmed and the guest were seated, with a newly found glow and ora of content about them, they were welcomed with happy cheers and cries of joy from all their loved ones. Throughout the evening there were so many ideal moments to steal for our Indian wedding photography and we were honoured to be the ones to do so! Soon our noses were introduced to the most delectable and heavenly smells that woke up everybody’s tastebuds as the traditional Indian food was served, with an array of curries and spices. The rest of the night that followed was filled with heartfelt toasts and the bride and groom opening up the dance floor with their magical first dance as a married couple. A moment we thrived in capturing for our Indian wedding photography. The guests showed off their best moves on the dance floor into the early hours and created a numerous amount of picture-perfect moments. We had an amazing time being part of this special day and were so thankful to have been given the opportunity, we wish Aalia and Vimal all the best and many years of happiness!